The Santa Fe Conservation Trust land conservation staff is available to help you make long-term plans for your property. There are several techniques available, all of which can be tailored to fit your unique circumstances. Your choice of which technique to pursue depends upon your goals for the property, the natural characteristics of the land, and your financial objectives, including income and estate tax planning. A landowner should seek professional legal and tax advice when considering conserving their property either through a Conservation Easement or Fee Title. The most traditional tool for conserving private land, a “conservation easement” is a legal agreement between a landowner and the Santa Fe Conservation Trust that permanently limits the uses of a property in order to protect its conservation values. Conservation easements allow landowners to continue to own and use their land, and sell the property or pass it on to family. The agreement is flexible and tailored to protect the land’s conservation values and meet the financial and personal needs of the landowner. A conservation easement may apply to all or a portion of the property, and need not require public access. For example, property owners can give up the right to build additional structures while retaining the right to grow crops or graze cattle. Future owners are bound by the terms of the conservation easement and the Santa Fe Conservation Trust takes on the responsibility and legal right to enforce it. If a future owner or someone else violates the conservation easement the Santa Fe Conservation Trust will work to have the violation corrected. The Santa Fe Conservation Trust is also responsible for making sure the conservation easement’s terms are followed, for example ensuring the ongoing health of a wetland. This is managed through land “stewardship” by the Santa Fe Conservation Trust. Conservation easements ride with the property, not the landowner. A landowner who places a conservation easement on their property still retains ownership and may sell, mortgage, or bequeath their land as usual. However, because it retires certain development rights, a conservation easement often significantly reduces a land’s potential monetary value. This figure, as determined by a special appraisal, is considered a charitable gift by both the federal and state government, qualifying the landowner for a federal tax deduction, and—since 2008—a transferable (saleable) NM state tax credit. Internal Revenue Code (IRC) § 170(h) states that a qualified conservation contribution is a contribution of a qualified real property interest (i.e., a conservation easement) to a qualified organization exclusively for conservation purposes. Preservation of land for outdoor recreation by, or the education of, the general public. Protection of a relatively natural habitat of fish, wildlife, or plants, or similar ecosystem. Each conservation purpose must be identified in the deed of conservation easement and further described in a Baseline Documentation Report. The Baseline Documentation Report is produced based on site visits, interviews with those familiar with the property, and research. In addition to describing the conservation values, the document outlines the current conditions on the property at the time the conservation easement is deeded. This includes landscape condition and all natural and human-made features as they relate to the terms of the conservation easement. The landowner’s current uses and future plans for the property are important considerations when embarking on a conservation easement agreement. Once identified these needs can then be discussed and incorporated into the terms of the conservation easement. The Santa Fe Conservation Trust recognizes that the viability of conservation relies heavily upon the landowner’s ability to secure reasonable and sustainable use of their real-estate investments. This use may include the continued working of the land, the right to develop home sites as well as the right to enjoy the recreational and aesthetic opportunities that open space affords. What is the Federal Tax Deduction? The value of an easement may be deducted from Federal income taxes as a charitable gift. A conservation easement donor may deduct the full value of the conservation easement up to 50% of adjusted gross income (qualified farmers may be able to deduct up to 100% of AGI). Donors may carry this deduction forward up to 15 years until the value of the charitable gift is spent in tax savings. For an easement to qualify for a farmer or rancher, it must contain a restriction requiring that the land remain “available for agriculture.” This provision also applies to farmers who are organized as C corporations. What is the New Mexico Land Conservation Tax Credit? The New Mexico Land Conservation Tax Credit is a state tax credit designed to encourage the conservation of New Mexico’s private open lands. Landowners who donate fee title land or conservation easements may receive a tax credit of 50% of the property’s value, up to $250,000, that can be used as a dollar-for dollar write-off of state income taxes. The tax credit is also transferable, allowing sale of the tax credit to a third party for cash—an attractive option for landowners whose state tax bills are relatively low. How much does it cost to donate a conservation easement? Landowners pay for the appraisal, the time and expertise of their attorneys and accountants and a title policy. The Santa Fe Conservation Trust incurs significant costs in accepting conservation easements and asks donors to help defray those costs. The Santa Fe Conservation Trust charges a Conservation Fee and we request a Stewardship Donation. The preparation of the NM State tax credit LCIA application (a two-step process), the drafting of the Deed of Conservation Easement, wildlife and vegetation inventories to create the Baseline Documentation Report and prepare topographic and aerial maps and photographs of the property. We work with you and your advisors to guide you through the process of protecting your property in perpetuity legally. We help you to prepare the documentation that you need to complete the NM tax credit process and the Federal IRS documentation that you will need to claim your tax deduction. With each conservation easement, the Santa Fe Conservation Trust and the landowner take on the responsibility and obligation to protect the conservation values of the property. Protection is ensured by ongoing stewardship of the land. Communication, stewardship education and support are essential components of a successful conservation easement program. On working lands (agricultural and timber lands) it may mean input on the development of a management plan. 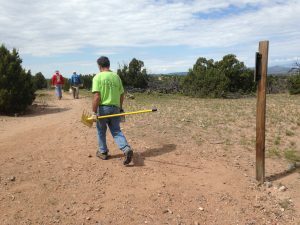 The Santa Fe Conservation Trust may be able to provide and/or identify expertise and other resources for such efforts. At a minimum, the Santa Fe Conservation Trust annually contacts the landowner and/or property agent and monitors each property to ensure compliance with the terms of the conservation easement. All of this is documented, compiled as part of the record for each easement and provided to land owners. Significant staff time and resources are required to fulfill the legal obligations of an easement. For this reason, the Santa Fe Conservation Trust has established an endowment to cover the costs associated with our stewardship responsibilities. Monitoring the conservation easement: the Santa Fe Conservation Trust visits properties under conservation easement at least annually to ensure that the terms of the easement are being met and to document the condition of the property. Legal defense: Part of the endowment will build the Santa Fe Conservation Trust’s legal defense capabilities. Over time, there may be violations of the conservation easement restrictions. The Santa Fe Conservation Trust needs to be prepared to defend restrictions through litigation if voluntary means fail. The Santa Fe Conservation Trust calculates costs to cover perpetual stewardship for each specific property. The Stewardship donation is a suggested charitable donation and is not a prerequisite for acceptance of a conservation easement. However, the Santa Fe Conservation Trust must cover these costs before accepting a conservation easement. What are the public benefits of a conservation easement? When landowners donate property to the Santa Fe Conservation Trust, they are giving the property’s title and all of its rights and interest to the Santa Fe Conservation Trust. Like conservation easement donations, land donations can qualify as tax-deductible charitable donations if they benefit the public by permanently protecting important conservation resources and meet other federal tax code requirements. The Santa Fe Conservation Trust will consider the two following types of Fee Title land donations. Protected lands are property that a donor would like the Santa Fe Conservation Trust to permanently conserve. Our decisions to accept these donations are based on their alignment with our strategic conservation goals. In some cases, when a donated property has some value for conservation but SFCT is not the appropriate owner, SFCT may sell the property and reserve a conservation easement. Trade lands are properties donated to the Santa Fe Conservation Trust that may or may not have significant conservation characteristics. They can be developed or not, and can be residential, industrial, or commercial. The supporter allows SFCT to sell the property so that we can put the proceeds towards our most important conservation initiatives. What are the Federal Tax Benefits for donating Fee Title? The federal tax code allows individuals and businesses to make non-cash contributions to qualifying charities and to claim deductions for these contributions on their tax returns. Gifts of donated property and other non-cash items have long been an important source of revenue for many charitable organizations and a popular deduction for taxpayers. Landowners that donate Fee Title land to the Santa Fe Conservation Trust may be able to deduct up to 30% of their Adjusted Gross Income (AGI) for a carryover period of five years up to the Fair Market Value(FMV) of the Fee Title land. The FMV is determined by an appraisal conducted by an independent qualified appraiser.